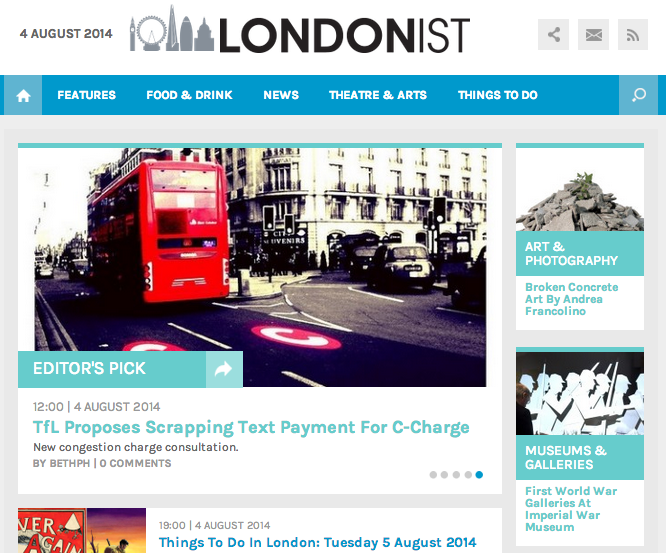 The Londonist is one of our favourite London guides. It is perfect for wanting to know what’s on in London, with loads of information on food and drink, theatre and the arts, and a wide range of other things to do, including deals on free and cheap ways to have fun in the capital. It also provides an extensive list of hotels and bars, so you’re clued up on exactly how to keep yourself occupied both day and night. The only downside is the somewhat confusing navigation and the outdated events that are still advertised. News category means you can keep up to date with all that’s going on in London. Make sure you double check the date of any event to make sure it is still on! The Londonist is ideal for those looking to get a bit of background on London’s versatile playground. From food and drink, to entertainment, news and weather, the site can give you all you need to know to help you plan your day, whether it’s instantaneous or in the not so distant future. Just have a little patience with the navigation as it is easy to get lost when browsing.